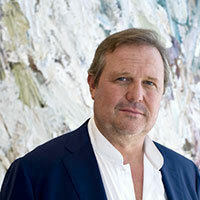 OLSEN, known previously as Olsen Irwin and Tim Olsen Gallery, was established in 1993 and exhibits a broad spectrum of Australian and international art, in the gallery, online, and at art fairs. Gallery founder and director Tim Olsen has cultivated a stable of artists that he feels presents a comprehensive and poignant view of the contemporary arts in Australia. With a continually changing exhibition calendar we showcase the work of both emerging and established artists. We have nurtured the careers of artists from their first exhibition out of art school and proudly see them now as leading lights in the Australian art scene. Foremost in the gallery's stable is John Olsen, now regarded as Australia's most esteemed living artist. In addition to the staging of countless critically acclaimed exhibitions the gallery has hosted the launch of many books devoted to his unique and ingenious art making. Tim has also negotiated the sale of some of the most significant paintings in Olsen's oeuvre to both private and institutional collections. Tim's enthusiasm for works on paper has also inspired a specific works on paper space the ANNEXE, which now resides directly behind the main gallery at 74 Queen Street, Woollahra. With a definite focus on the work of Australian artists, we are actively fostering a dialogue between Australia art and our international colleagues with exhibitions of leading contemporary artists from Europe, Asia and America being planned for the coming years. OLSEN draws on these international partnerships for the collection development of our private and institutional collectors. In 2017 we opened a space in New York called OLSEN GRUIN, situated in the lively lower east side, as a space for both Australian and international contemporary artists.